Plants, sound, and sustainable architecture were used to create this public display project for the NYCXDesign festival and Global Design NYU. The idea was to "re-nature" the most overwhelmingly intense urban environment on Earth. A modular open-sphere was built for visitors to walk through an imaginative microcosm space. 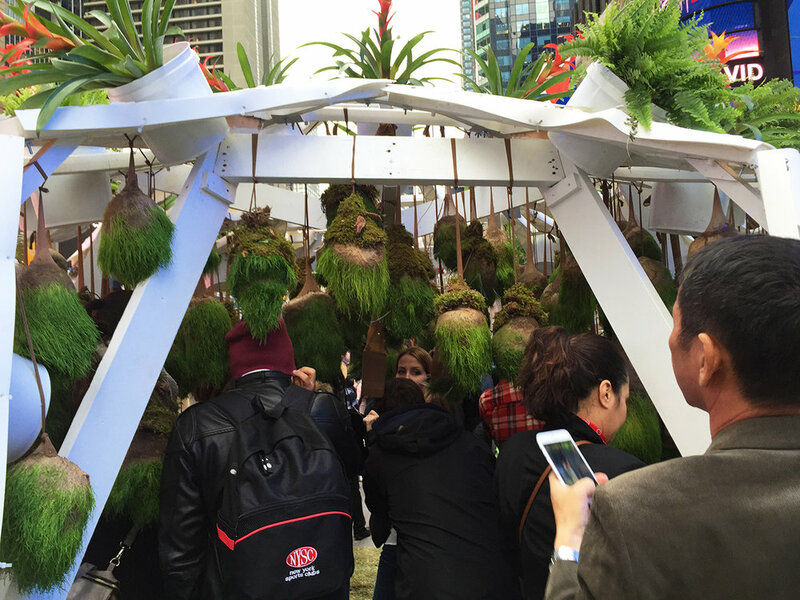 Using pantyhoses and ryegrass, we created an interactive hanging garden that responded to human touch. The more people interacted with the plants, the more these responded with light and sound outputs. The entire project, start-to-finish, was erected and removed in a 24 hour period on May 10th, 2016. It was a place to speculate about Times Square’s consumer culture and reimagine it into an environmental future.